The autumn of 1946 was pretty dismal in England. Eighteen months since the end of the war in Europe, the early mood of jubilation was long gone. The country was in recession, reconstruction had not yet started on any significant scale, demobbed former-servicemen were finding it hard to get work, and there was no prospect of the rationing for food and clothing ending anytime soon. Len had served in the navy during the war, delivering essential supplies to Russia on the arctic convoys, and tying up a substantial part of Germany’s Navy and Air Force. On one voyage to Murmansk, his convoy was waylaid by enemy aircraft and u-boats and several ships were sunk. 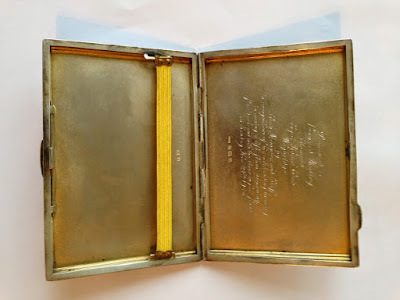 Traumatised, Len was transferred to clearing up London bomb damage but found retrieving civilians' bodies so distressing that he rejoined the merchant marine. 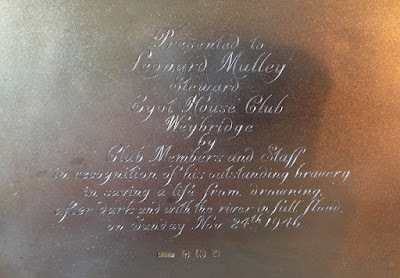 Although he returned to civilian life with few formal qualifications after the war, Len’s strong work ethic and good manner with people secured him a job as a Steward at the rather theatrical Eyot House Club, which sits on its own island on the Thames at Weybridge, in Surrey. 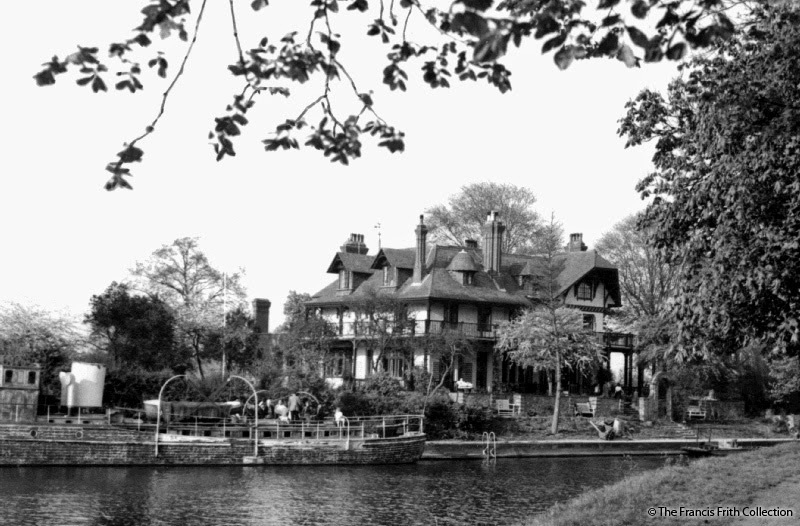 Eyot House had been built by D’Oyly Carte, the Victorian music impresario, theatrical producer and hotelier who had already built the Savoy theatre and hotel in the Strand, among many other famous venues. In its heyday the place would have been full of celebrity guests such as WS Gilbert and Arthur Sullivan, and writers like JM Barrie, which might explain why D’Oyly Carte once reportedly kept a crocodile on the island. By 1946, when Len worked there, the club was reduced to trading on its former glory, but it still held a certain mystique. There was as yet no footbridge to the island, so guests arrived by boat, or had to pull themselves across on the chain ferry. Once installed however, the wrap-around, Colonial-style veranda provided a strong sense of occasion, along with commanding views down the river. The sun had set just after four in the afternoon on 24th November 1946. Although the weather had been unseasonably mild, there had been heavy rain for some days and most club members were inside, drinking tea or something stronger, and listening to the London Symphony Orchestra concert at the Royal Albert Hall being broadcast by the BBC Home Service. The setting could hardly have been more Agatha Christie, when suddenly shouts were heard coming from the river. The Thames below the club house was at full tide and, further swollen by the recent heavy rains, the water was high and moving rapidly. Perhaps Len’s years in the navy meant the water held less fear for him. 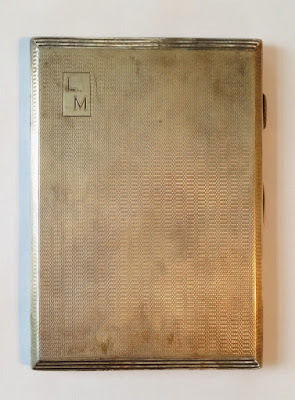 It is possible that he had helped saved others when his convoy had been torpedoed. However perhaps he had never had the chance, and the water held worse memories for him than for many. What we know for certain is that it would have taken great courage to plunge into the dark, fast-moving river that Sunday evening, but Len did not hesitate. Some time later he managed to swim to the bank, fighting hard to keep his head up, one arm clamped around a half-drowned woman. Who she was, and whether she was in the water through accident or intent, has been swept away by time and tide, but she survived that night because of Len. These dramatic events are recorded in three very brief accounts. A few lines were reported in the local paper that week. 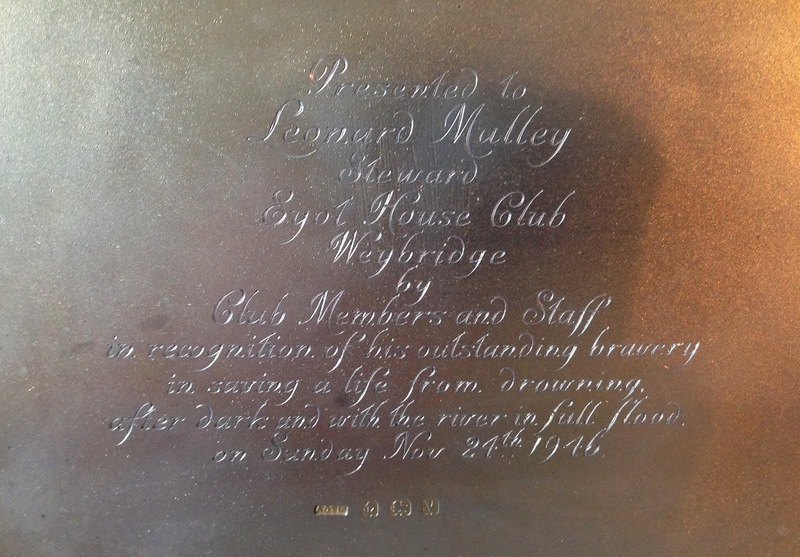 Shortly later Len was presented with his cigarette case by impressed members and staff of the Eyot Club House, ‘in recognition for his outstanding bravery in saving a life from drowning after dark, and with the river in full flood’. 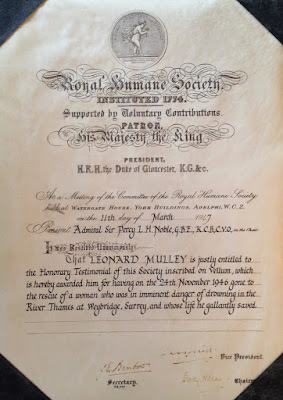 The following year the Royal Humane Society presented him with their ‘Honorary Testimonial on Vellum’, awarded when someone has risked their life to save another, and in this case specifically ‘for having gone to the rescue of a woman who was in imminent danger of drowning in the River Thames at Weybridge, and whose life he gallantly saved’. Sadly nothing more is known, except that the envelope enclosing the Royal Humane Society certificate was addressed to Len not at Weybridge, but at the Norfolk Hotel at Arundel in Sussex, where he was employed as Head Waiter, within a stone’s throw of the River Arun and not far from the coast. It seems that although changing jobs he wanted to stay close to the water. 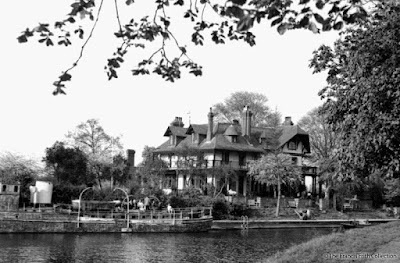 The Eyot House Club closed not long later, having been raided by police who stormed the island by boat late one Saturday night, and arrested a number of people for drinking after hours. Tragically, Len was later killed on his way to work when he was accidentally knocked off his bicycle by another vehicle. He may not have been highly decorated for his service during the war, no DSO or medals beyond those standard for active service, but Len's story reminds us that heroism is not confined to times of war. Len continued to live by the principles he had fought for during the war, risking his life for the security of others in the peace. He was a truly good man, and a hero. Not everyone has a perfect idea about heroes which use to be under covered, but there are bloggers like this who keep highlighting such heroes. Nice work! My Weapon is My Writing: Olga Tokarczuk at the London Book Fair. Perhaps this International Women’s Day, we might consider judging women for their agency!